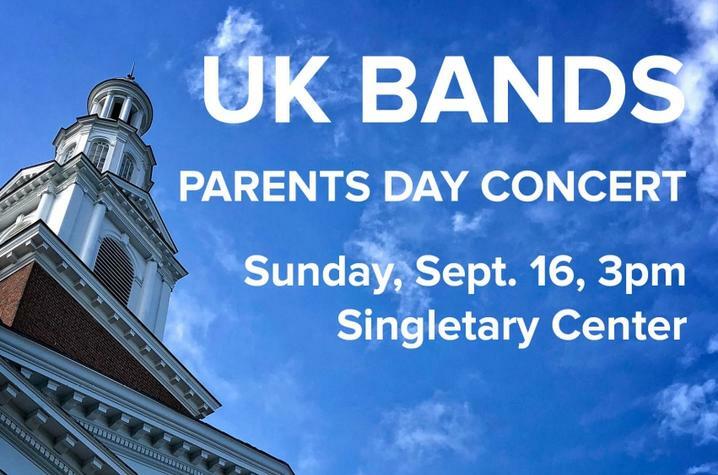 UK's Wind Symphony and Symphony Band will present a Parents Day Concert 3 p.m. Sunday, Sept. 16, at Singletary Center. LEXINGTON, Ky. (Sept. 12, 2018) — The University of Kentucky’s Wind Symphony and Symphony Band conducted by John Cody Birdwell, professor and director of UK Bands, and George Boulden, associate professor and associate director of UK Bands, will present the annual Parents Day Concert 3 p.m. Sunday, Sept. 16, in the Singletary Center for the Arts Concert Hall. The concert is free and open to the public. The event’s program will include festive openers "Esprit de Corps" by Robert Jager and Philip Sparke's "Celebration," as well as feature an off-stage trumpet fanfare from Jason Dovel, assistant professor of trumpet, and company. Enjoy familiar tunes from the UK Symphony Band including "Wayfaring Stranger" and "Scarborough Fair" while the UK Wind Symphony wishes Leonard Bernstein a happy 100th birthday with "Three Dance Episodes" from "On The Town." Guest conductor Eric Peterson of Brevard College (North Carolina) will lead the Wind Symphony in Julie Giroux's breathtaking "One Life Beautiful." The program will round out with UK alumnus Ryan George's "Portrait in Jade" and the monumental "Armenian Dances" by Alfred Reed. The UK Wind Symphony is comprised of the finest wind and percussion graduate and undergraduate students in the UK School of Music. As the centerpiece of the band program that has entertained the Commonwealth of Kentucky for over 100 years, the Wind Symphony continues a rich tradition of performing the finest traditional and contemporary compositions in the concert band repertoire. The UK Wind Symphony has traveled to China, where the ensemble performed for thousands of people in person and via broadcast during a 10-day concert tour of several of the country's most prominent and highly recognized concert venues. The UK Symphony Band consists of music majors and talented musicians from outside the school that audition each semester. The ensemble performs live music for large and chamber ensembles. UK Symphony Band was a featured ensemble at the 2003 and 2012 Kentucky Music Educators Association Conference (KMEA) and the 2005 Southern Division MENC/Florida Music Educators Association Conference. Additionally, UK Symphony Band was invited to perform at the 2008 KMEA Conference and presented a diverse concert program at the annual state convention.